The Outer Coastal Plain of New Jersey is a largely undeveloped pine region in the northeastern United States. The Pine Barrens comprise 550,000 hectares of upland and wetland vegetation. Much of the region is owned and managed by the State Forest Service and Fish Game and Wildlife, although some tracts are privately owned. Soils underlying this region primarily consist of unconsolidated deposits of sand with some clay, silt and gravel. The soils are not well developed; they are low in organic matter content, strongly acidic and very low in natural fertility, forming sandy podsols of the Lakehurst and Woodmansie soil series. The species diversity of the vegetation in the upland forests is relatively low. Pine — pitch pine (Pinus rigida) and shortleaf pine (P. echinata) — and oak — black oak (Quercus velutina), white oak (Q. alba), scarlet oak (Q. coccinea) and chestnut oak (Q. prinus) — dominate the canopy layer. Ericaceous species such as blueberry (Vaccinium pallidum) and huckleberry (Gaylussacia baccata) dominate the shrub layer. Atlantic white cedar (Chamaecyparis thyoides) dominates the wetlands. In addition, some 4,000-9,000 hectares (depending on definition) of this area is occupied by dwarf or pygmy pine plains. The seasonally dry ecosystem is prone to wildfire, and many Pine Barrens plant species have evolved adaptations to cope with this periodic disturbance. This history of fire predating European colonization, along with logging and fires in the 18th, 19th and early 20th centuries, are largely responsible for the appearance of the forests today. While wildfires are still common, their identification and successful control has improved greatly beginning in the second half of the 20th century. It is estimated that an average point in the Pine Barrens upland forest burns at about a 65-year interval versus a 20-year interval in the first half of 20th century. The U.S. Forest Services has used prescribed burning in the New Jersey Pine Barrens since the late 1930s. Originally used for its effect on stand composition and wildlife habitat management, it is now practiced to reduce fuel load and the consequent risk of wildfire. 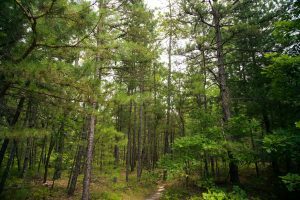 The area, which contains protected and endangered flora and fauna, and more than 1 million acres were designated the Pinelands National Reserve — the first National Reserve in the United States — in 1978. The New Jersey Pinelands Commission was established to oversee development and conservation. It was designated a United Nations International Biosphere Reserve through the Man and the Biosphere Program in 1988. A number of non-profit advocacy organizations exist in the region (the Pinelands Preservation Alliance, New Jersey Conservation Foundation and The Nature Conservancy) to provide information and public education on the history and conservation of the area. Boyd, H. P. (1991) A Field Guide to the Pine Barrens of New Jersey. Plexus Publishing, NJ. Forman, R. T. T. (Ed.) 1979 Pine Barrens: Ecosystem and Landscape Academic Press, New York. Collins, B. R. and Russell, E. W. B. (1988) Protecting the New Jersey Pinelands, Rutgers University Press, New Brunswick, NJ. Collins, B. R. and Anderson, K. H. (1994) Plant Communities of New Jersey: A Study in Landscape Diversity. Rutgers University Press, New Brunswick, NJ. Page last updated by Pinelands Field Station at 11:01 am August 13, 2018 . This page was printed from http://pinelands.camden.rutgers.edu/about/the-pine-barrens/ at 2:40 PM Thursday, April 18, 2019.